Here are two great offers if you're looking for new recipes and coupons. Sign up for each of these free newsletters and receive free recipes and savings coupons. Just click on the images below to register. 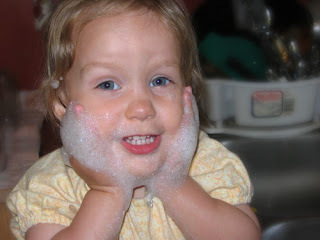 For more frugal living ideas, check out Frugal Friday at Life as Mom. My husband & I are trying to eat a main dish salad every day and we need your help. We are looking for healthy, main dish salad recipes because eating healthy works for us. We also have a large garden this year which makes eating fresh salads even more frugal. 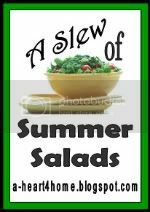 Please, post your favorite salad recipe on your blog and link up here so that we, and everyone else, can enjoy plate after plate of fresh salads this summer. Remember to leave a link to this carnival so everyone can find more healthy salad recipes and join in the fun! You can also link to a salad recipe you've posted in the past. To help spread the word about this carnival, grab this button for your blog post or sidebar. If you don't have a blog, please leave your recipe in the comments section of this post. This carnival will be open all summer, so please continue to add your tried-and-true favorites as well as new concoctions. Thanks everyone & happy eating! Please, leave your link in a comment and I'll add it to this post. 1. Taco Salad ~ Bloom Where You're Planted! This post contributed to: Tasty Tuesday, Tempt My Tummy Tuesday & What's Cooking Wednesday. It seems like there has been a lot of buzz recently about quiet time bins and activities, and deservedly so. As parents of a toddler and an infant, we know how difficult it can be to find activities that young children can complete independently. It becomes even harder if you desire for your children to be learning while completing an activity that they enjoy. 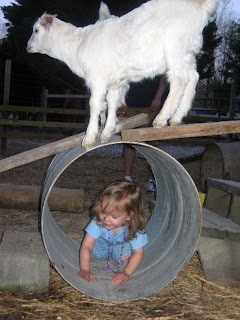 We've been searching online for fun and educational activities that our daughter could complete on her own. However, we haven't been able to find more than a handful of high quality ideas. Then we discovered Preschool Activities in a Bag. We were drawn in by their slogan, "Where fun and education fit in the same bag." Preschool Activites in a Bag was developed by Paula Reetz (mom of 7) and Sherri MacLean (mom of 4), two homeschooling moms who were looking for ways to keep their preschoolers occupied and learning while they worked with their older children. They began brainstorming ideas and have now written two books full of activities (34 & 33 activities) that will entertain and keep preschoolers learning. 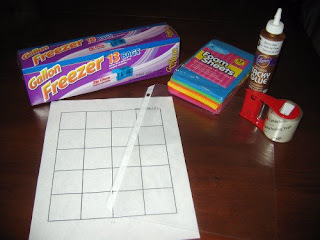 Each activity fits inside of a gallon, zippered freezer bag. The activities also cost, on average, about a dollar to assemble. In their books, Paula and Sherri also give all the information you need to organize a swap with other preschool moms. The basic idea of these swaps is that each participant puts together identical activities for all the participants. Then when you meet, everyone exchanges activities and you end up with a number of different activites for your preschooler. 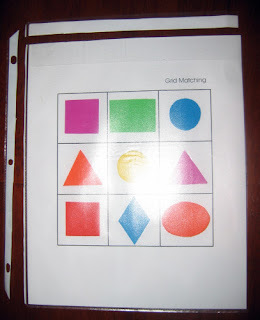 This activity develops matching skills. ~1 gallon plastic freezer bag with sliding "zipper"
*Since the Activities in a Bag are intended for ages 3 and up, we modified this activity a little for our (almost) 2 year old by reducing the number of foam shapes from 20 to 9. The supplies and directions are for the activity as originally written, but the photos show the activity as we made it for our daughter. We also decided to just use basic colors and basic shapes so we could also work on these concepts. 2. 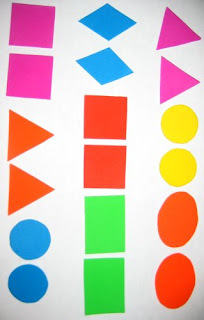 Glue one set of foam shapes onto the cardstock grid. When the glue is dry, place the grid into a sheet protector, trim off the flap with the hole and cut 1/2" off the top so it'll fit in the bag easily. We also folded the wide packaging tape over the top of the page protector so that Emahry can't remove the grid. 3. Make the label for the activity (example is included in the book). Attach the label to the top front of the bag with wide, clear packaging tape. 4. 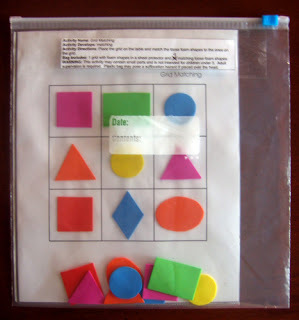 Place the grid (inside the sheet protector) and the matching loose foam shapes inside the bag. 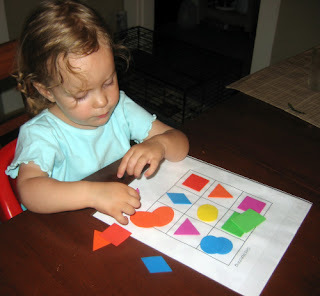 ~Place the grid on the table or floor and match the loose foam shapes to the ones on the grid. You can purchase Book 1 or Book 2 for $21.95 (hard copy) or $15.00 (eBook). 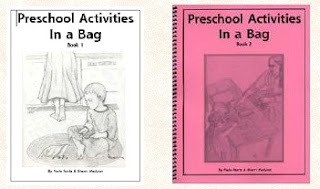 You can also purchase both books in the Preschool Activities in a Bag Bundle for $37.95 (hard copy) or $27.00 (eBook). Be sure to check out Activity Bags' Science Experiments in a Bag, Daily Activity Journal 1, and Daily Activity Journal 2. If you make a purchase, please let Paula and Sherri know that you found out about their products here at A Heart for Home. 1. Head over to Activities in a Bag and browse through the shop. Then come back here and leave a comment telling us why you'd like to win one of their Preschool Activities in a Bag books. If there's a specific one you prefer, please let us know and we'll try to accomidate you. 2. Gain an additional entry by placing our button on your blog (include the link in your comment). 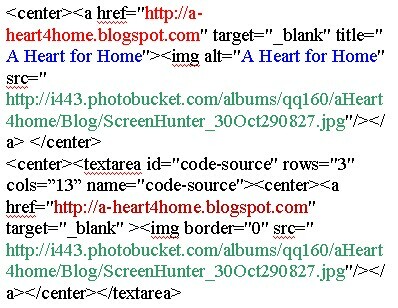 ~Simply copy the code under the button and paste it into the text box for an Html Gadget on your blog's layout. 3. Subscribe to A Heart For Home (let us know if you've already subscribed). 4. Follow Our Blog (let us know if you already follow). 5. 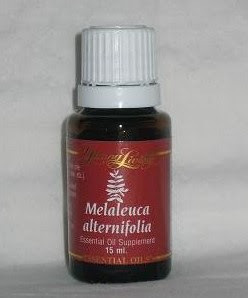 Post about and link to this giveaway on your blog or tweet about this giveaway (leave us the link in your comment). That's one with the reason you'd like to win one of the Preschool Activities in a bag books, one telling us our button is on your blog (with the link), one telling us you've subscribed, one telling us you've signed up to follow our blog, & one with the link to your blog's advertisement or tweet of this giveaway. The giveaway will end Monday, May 11th, at 12 Midnight EST. We will pick the winner through random generator. Make sure you leave a way for us to contact you. Head over to Heavenly Homemakers for more Springtime Giveaways. This past week, we began teaching Emahry how to wash dishes. She's been "helping" with the dishes since she was about a year old. However, we want to make sure we take advantage of this age where she wants to help by teaching her how to wash dishes correctly. We've started by simply filling the kitchen sink with about 2 inches of water and adding dish detergent. We them place a few unbreakable items in the sink for her to wash. These items normally consist of small metal bowls, measuring cups, and small plastic containers that need to be cleaned before put into the recycling bin. We begin each training session by showing her how to use the dish cloth to wipe the dirty dishes. Then we show her where to place the washed dishes. For us, we place all the washed dishes in the second sink and then rinse them all at the end because we've found that we use less water this way. 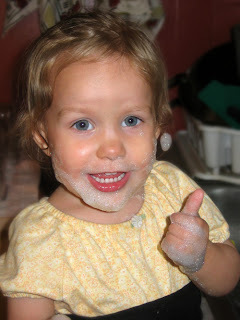 Once we've demonstrated how we want her to wash the dishes, we step back and let her do it. For the first few dishes I normally stand beside her and offer verbal reminders, but after that I move on to some other work in the kitchen and just check on her every couple of minutes. When Emahry has finished washing all of the dishes that we placed in the sink (or on the counter) we rinse them together and place them in the drying rack. We still have to help with this part because she can't reach the drying rack and she tends to get distracted wanting to play in the water. When we are finished she is able to play in the sink water. If it's gotten pretty dirty we replace it with about an inch of new water and lots of bubbles. This is a reward for Emahry but it also allows me time to complete my kitchen tasks. This is a great time for me to work on meal preparations, take stock of the fridge, freezer, and cabinets in order to plan meals, prepare freezer meals, and complete general cleaning chores. 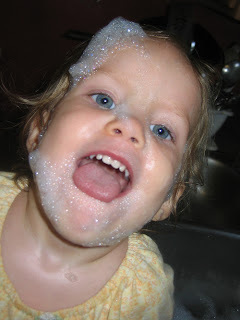 Here are a few more pictures for Emahry's sink time fun. 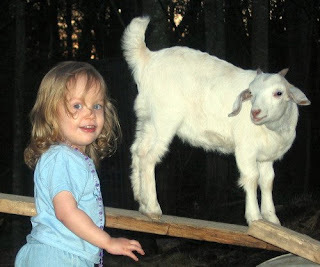 How do you involve or teach your children to help with household tasks. We're always looking for new ways to include and train our children, so please leave a comment with your input. This post contributed to I Am Blissfully Domestic. A quick photo of the kids enjoying each other's company. 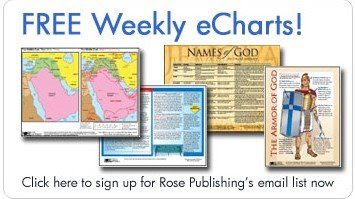 We've been receiving free weekly Bible e-charts from Rose Publishing for a few months and have been very impressed with the quality and content of the e-charts. Simply fill out your name and email address and you'll receive a link to a new free Bible e-chart in your inbox each week. Here are the titles of some of the e-charts we've already received. We've set up a special folder on our computer for these e-charts so we can find them easily when we need them. We're planning on using them as Bible resources for homeschooling in the future as well as for our own personal Bible study. Click on the image above or click here to sign up for these free weekly Bible e-Charts. Click on the button below to visit my friend Kristin's blog for a chance to win a $25 Gift Certificate to RG Natural Babies. Here are a few things I'd choose from if we win the gift certificate. Get 250 FREE Business Cards, 140 FREE Return Address Labels, 100 FREE Standard Postcards, 25 FREE Small Business Magnets, 10 FREE Invitations and more from VistaPrint. Click on the image above for more details and to design and order your FREE Samples. Getting Free Business Cards and More Works for Me! My mom was here all morning helping me complete a set of curtains for our bedroom. While it was great to finally have curtains up (thanks, Mom!) the rest of the house was looking a little neglected from lack of cleaning this morning and sewing supplies strewn everywhere. 1. Move clothes to dryer. 2. Put away all sewing supplies. 4. Wipe down kitchen counters. 7. Cover cold frame for the night. 8. Clean off table. Well, I got it straightened and all the papers in ONE pile. I feel much better about the house now. I'm heading to put the kids to bed and maybe fold some laundry (or maybe I'll just call it a night and go to bed myself). Head over to Organized Everyday to see other Blitzes for this week. Back in January we had the pleasure of receiving a pouch style baby sling from My Sweet Punkin Patch. We've really enjoyed this sling and have been impressed with its style and durability. (Read our review here.) 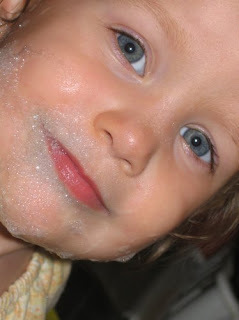 My Sweet Punkin Patch is owned by Brook, a stay-at-home mom to 5 children, ages 8, 6, 4, 2, and 9 months. 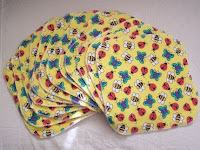 My Sweet Punkin Patch carries pouch slings, ring slings, AIO cloth diapers, diaper covers, and cloth baby wipes/washcloths. A couple of weeks ago we received another item to review for Brook. It was this All-In-One (AIO) cloth diaper. AIO Diapers are our favorite cloth diapers when we are out and about. 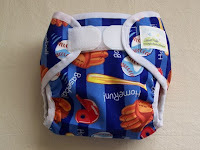 They are also very easy for cloth diaper newbies to use since they go on very much like a disposable diaper. Brook's AIO diapers are sewn under a cottage industry license granted by Ella's Diapers. 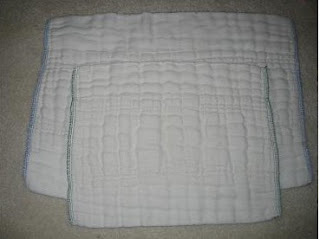 The diaper body is made of two layers of white birdseye, with a hidden 3-layer burley knit terry soaker. The outer layer of these diapers is a waterproof PUL. These AIO Diapers have Aplix (soft "velcro") closures for easy adjustments and even have a crossover tab for smaller waists. 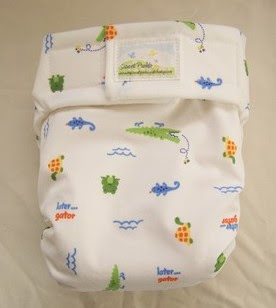 We love the adorable Later Gator print that is on our diaper. 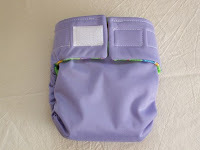 My Sweet Punkin Patch also offers AIO Diapers with solid PUL outers in Light Lavender, Light Pink, Butter Yellow, and Lavender. We've really been enjoying this AIO Diaper. It is absorbant without being too bulky. 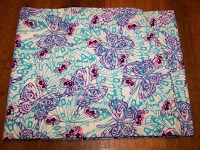 The fabric is soft and I love how soft and strong the Aplix closures are. The crossover tab would have been great for Jonathan when he was born because it was very hard to get diapers tight enough around his tiny waist. Here are a some more of my favorite things from My Sweet Punkin Patch. Click on the photo to view each listing or simply browse the entire shop. If you make a purchase, please let Brook know that you found out about the shop at A Heart For Home. Interested in having your shop featured in our Etsy Shop Showcase? Leave me a comment & find out more here. Do you have products that you'd like me to do a review for, but don't sell on Etsy? Just leave me a comment with your e-mail address & I'll contact you about doing a review. Also, view all of our Etsy Shop Showcases listed under the Review tab. ~ a listed pouch (other than the silk) Subject to availability at the close of the giveaway. 1. Head over to My Sweet Punkin Patch and browse through the shop. Then come back here and leave a comment telling us which item(s) you'd like to win. 2. Subscribe to A Heart For Home (let us know if you've already subscribed). 3. Follow Our Blog (let us know if you already follow). 4. Blog or Tweet about this giveaway (leave us the link in your comment). 5. Place our button on your blog (leave us a link to your blog in your comment). Simply copy the code under our button and paste it into a HTML gadget on your blog. The giveaway will end Friday, May 1st, at 12 Midnight EST. We will pick the winner through random generator. Make sure you leave a way for us to contact you. For other frugal ideas, head over to Frugal Fridays. If you've ever been fortunate enough to try Dale and Thomas' Drizzlecorn than you know how delicious it is. We normally are given some around the holidays, but go without the rest of the year because it is so expensive. 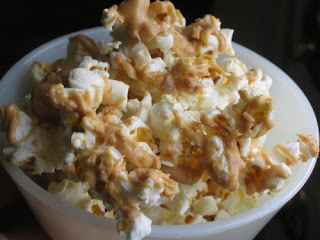 Gourmet Drizzle Popcorn is so easy to make and is very easy to customize according to your favorite flavors. 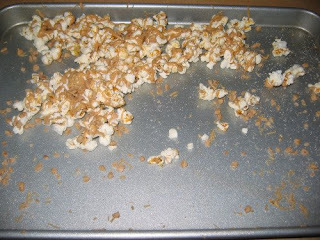 Here's our recipe for Gourmet Drizzle Popcorn. Congratulations to these five readers who have each won a pack of Goji Berry Seeds from Nine Lucky Stars. Didn't win, but would still like to add these amazing berries to your garden or landscape? Go here to order your own Goji Berry Seeds. I didn't know when we stopped by my parents house last week that we'd end up having so much fun with the kids across the street. No, not the human variety, but the four-legged, furry version with little horns. My parents' neighbors have a miniature farmyard within city limits. 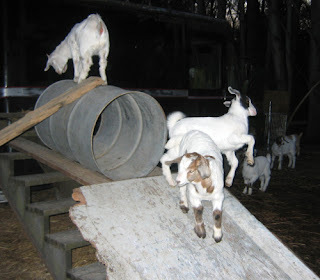 Occupying this farm are chickens, dogs, llamas, a horse, and goats. When I say goats, I mean a lot of goats. A few months ago a neighboring goat got into the neighbors fence and managed to get all three of the female goats pregnant! So now instead of 6 goats, my parents' neighbors have 15 goats! One goat had twins, one had triplets, and one had quadruplets. The poor neighbors had to deliver all 9 babies within a few days of each other. I don't think they slept all that week. All the kids are now doing well. It's so much fun to watch them playing with eachother. Even so, Emahry wasn't content with watching, she wanted to play, too. Good thing she was still wearing her gardening clothes and I had remembered to put the camera in the van. 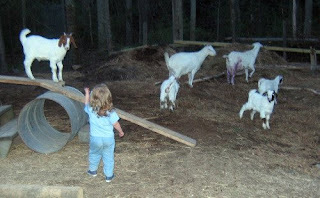 Emahry "snapping" her fingers and calling the goats. 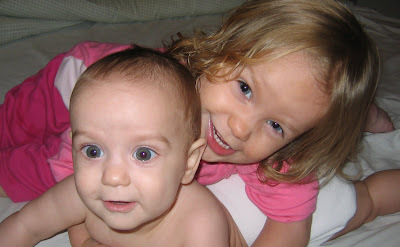 and one more, because they are just so cute. What type of pets do you have in your home? 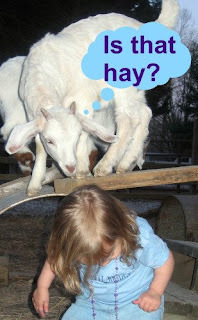 Would you ever want farm animals? Why or why not? We'd love to read your opinions and experiences. 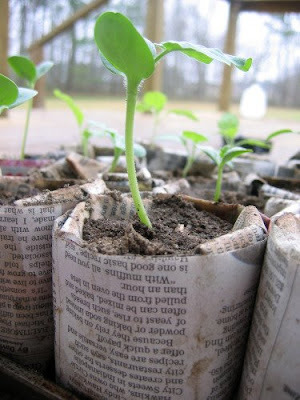 Many of our seedlings have now outgrown the seed starter trays and pots we made from empty toilet paper rolls. However, they still need to be hardened off. Also, though it's really warm compared to the snowy weather we had less than a month ago, the temperatures aren't consistently warm enough to transplant our seedlings to the garden yet. To keep with the spirit of saving some green in the garden, we didn't want to have to purchase pots to transplant the seedlings into. We searched online and found that we could use newspaper to make pots by folding the paper origami style. We found a few different variations of this technique, but we ended up having to combine them a little in order for our pots to work. 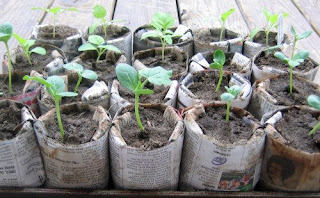 Here's our step-by-step process to make these sturdy recycled newspaper pots. A frugal gardener is a happy gardener! How are you saving money around the house this spring? We'd love to hear all of your ideas for being a little more frugal. Please, leave a comment so others can be inspired to live more simply on less income. This post contributed to: Thrifty Green Thursday, Frugal Friday, The Garden Club & I am Blissfully Domestic. 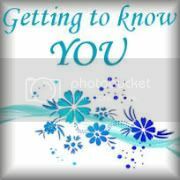 Lynnette at Dancing Barefoot on Weathered Ground is hosting a "Getting To Know You" event. Head over and leave a comment telling about your blog and your favorite five blogs to read. Lynnette will feature one commentor every Friday and Monday to help introduce other bloggers to your blog. Make sure you sign up to follow so you can find some new, interesting blogs to read. Who knows, you might find a new favorite. I'm sure you've seen lots of blogs that have a button like this with a scrolling text box underneath that houses the button's code. This makes it easy for other people to place your blog's button on their blog and link effortlessly to you. Make sure that there is only one http:// before your web address and before the image web address. If you copy and paste you may need to delete an extra http:// in order for the code to work. You can adjust the height and width of the text box by changing the values after the rows= and cols= places in the code above. Here's an example of what the code will look like with the information filled in. Add here's what the gadget section should look like on your blog. Now, go add a button to your blog so all your readers can place it on their blogs. While you're at it, why not get our button? What to know how to leave an embedded link in a comment? Please, let me know if this post was helpful to you. If it doesn't work, please, double check the code to make sure you haven't accidentally deleted something. Still need help? Leave us a comment and we'll try to help you figure out the problem. Many people have asked how to do this in Wordpress. Unfortunately, I have absolutely no idea since I've only used Blogger. Sorry, guys! I guess growing up I thought that when I got married and had children, loving my husband and my kids would come completely naturally. Boy, was I wrong. 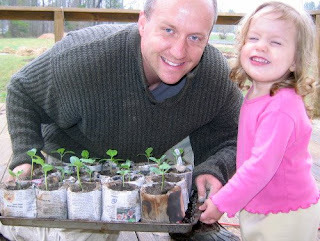 Sometimes it is really easy to love my husband~when he is kind, thoughtful, gentle, and hard-working. And sometimes it is easy to love our children~when they are cute, obedient, cheerful, giving, and helpful. But, sometimes it is difficult to love those that are closest to us. We see all aspects of them and are present to witness their less desirable traits and days of poor choices and bad moods. These moments, though the hardest, are the exact time that our family needs our love the most. By loving our families through these less lovable moments we can, in fact, show a small glimpse of the love that God shows towards us. Romans 5:8 says, "But God demonstrates his own love for us in this: While we were still sinners, Christ died for us." Also, in Ephesians it says, "Be imitators of God, therefore, as dearly loved children and live a life of love, just as Christ loved us and gave himself up for us as a fragrant offering and sacrifice to God." (Ephesians 5:1&2) The best way to show our family and the watchful world around us the love of God is to love them, especially when they are unlovable by our standards. How do we do this, you might ask. Only by experiencing the true love of God are we able to show genuine love to others. In 2 Thessalonians 2:16&17 it says, "May our Lord Jesus Christ himself and God our Father, who loved us and by his grace gave us eternal encouragement and good hope, encourage your hearts and strengthen you in every good deed and word." It is only through God's strength that we can accomplish the goal of loving our family well. We must give up our selfish wants and desires and act in accordance with his will. As followers of Christ we know that the will of God is for us to love him first and then to love others. More specifically, we know as wives and moms that God's desire is that we love him, love our husbands, and love our children. These should always be our most important priorities. In our small group meeting last night, our leader (a more mature man who has been married for 57 years) said that the best way he's found to measure how his relationship with God is growing is by examining how his love for his wife is growing. 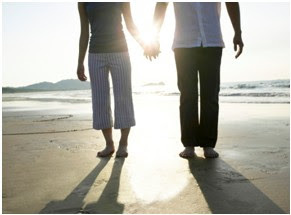 If he has become more compassionate and caring towards her, he has grown closer to the heart of God. However, if he has developed a habit of being irritable and unkind towards her, he has drifted from the will of his Father. I know I have a lot of improvements to make in how I love my family. ~I need to be more attentive to Tim when he needs a listening ear, instead of thinking about all the other things I need to check off of my list. ~I need to be more patient with Emahry and even more consistent in training her so that we can enjoy a sweeter fellowship together. ~I also need to be less irritable towards Jonathan when his swollen gums cause him to wake in the early hours of the morning when I would rather be enjoying some peaceful sleep. It's only by the grace and strength of God living in me that these things will be accomplished. I'm so thankful that I serve a God who can work through me to do things that would be impossible with my own weak strength. 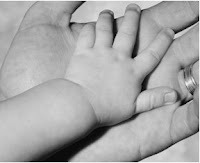 Do you struggle with loving your husband or children when they are unlovable? How can you begin showing your family more love today? We'd love to read your thought or comments. Visit Tammy's Recipes to see how other people are loving their families. This post contributed to I am Blissfully Domestic.